If you’re new to lentivirus production, SBI’s LentiStarter 3.0 Kit is a great way to get started. With optimized reagents designed to deliver high-titer virus preps, the LentiStarter 3.0 Kit takes the worry out of lentivirus production and is suitable for any application where stable gene delivery and expression is desired. The Kit includes enough reagents for generating lentivirus from either two 15 cm plates or five 10 cm plates. Get started producing lentivirus today—order the LentiStarter 3.0 Kit. *One transduction reaction is defined as 500 µL of total volume in a single well of a 24-well plate. *Based on infection of HT1080 cells with the pre-packaged virus format of SBI’s BLIV 2.0 reporter MSCV-Luciferase-EF1a-copGFP-T2A-Puro (Cat# BLIV713VA-1) and the appropriate conditions for polybrene, TransDux, and TransDux MAX. 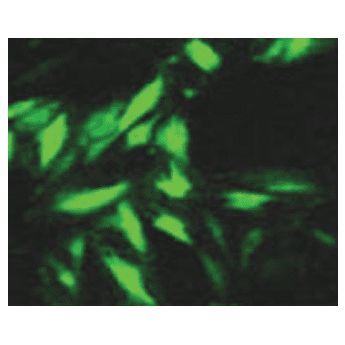 Virus transduction & integration efficiency was measured using SBI’s UltraRapid Titering Kit (Cat #LV961A-1).